The data-driven value of Magento 2, what to know before beginning, one of our top strategies for mitigating risks, and real insights from a Magento 2 retailer. As anyone in the digital commerce industry can tell you, migrating or upgrading an ecommerce platform is no small feat. After completing more complex Magento 2.x implementations than any other agency, we’ve created this Migrating to Magento 2 guide to help you navigate this process and to share key lessons we’ve learned. We show you how to explore opportunities to revisit and refresh your site pre-migration. This includes the cost of migration, how to select extensions and partners, and how to prepare for success. In this detailed section we share our recommendations for retailers looking minimize the risk of migrating to Magento 2. Our favorite strategy? Appointing a Minimum Viable Product Champion. We often find ourselves sticking with what works instead of adopting new technologies to drive our strategic goals. While it’s important to consider the risks of adopting new technology, it’s also worth acknowledging the benefits. 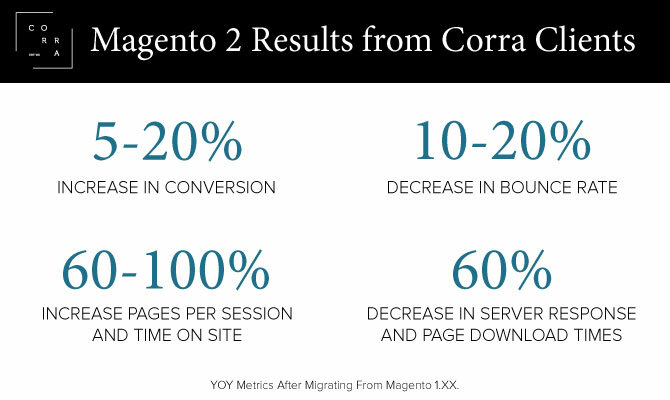 When it comes to Magento 2, the benefits are many. Miracle Ventures, the largest women’s swimwear manufacturer in the country, recently launched their KiKiRio site on Magento 2. Now that the site is up and running, their Director of Creative, Ecommerce & Technology talks about his first impressions of the platform, and his advice to other retailers thinking of making the move. Corra, one of only five Magento Global Elite partners, creates transformative commerce experiences for fashion, beauty and lifestyle brands. After participating in the Magento 2 merchant beta program, the Corra team has launched 12 Magento 2 sites across 4 continents. Corra offers best-in-class creative services, from branding and visual design to UX strategy and optimisation. Our team develops elegant and customer-centric solutions that resonate with users and create a clear path to purchase on all channels and all devices.